Buying gifts for family and friends is stressful enough, but finding the perfect give to give your child’s teacher is an unnecessary struggle. 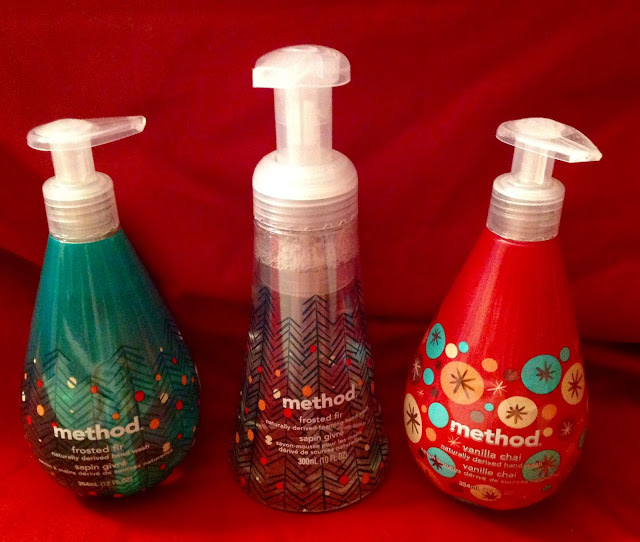 If you’re working on a holiday gift story, the Method Holiday Hand Wash Collection creates an ideal gift set. The seasonal scents are sure to sleigh a favorite teacher with frosted fir and vanilla chai, each complemented by a fun + festive forest design which evokes snow-dusted evergreens and bright baubles and sparkling stars. Cassandra's Review- I favored the Frosted Fir scent over the Vanilla Chai but they are both really nice on my hands. I would not use them right before eating because the stronger fragrance will be very noticeable. They are a really great hand soap for holiday parties and my family enjoys the blast of scent they provide during use and they are not hard to rinse off. If I won, I would keep this for myself because I would use them in our guest bathroom. If I won, I would keep this for myself and use them in our guest bathroom. I would keep for myself. I like Method products and I haven't had these scents before. I would keep this for myself. Wonderful smelling hand soap is a everyday luxury I really enjoy. I would keep this. One of my vices is that I really love having nice hand soap in each bathroom and kitchen. I usually buy soaps for different seasons and holidays and this is right up my ally. Thanks so much. I would keep this for myself for use during the coming holidays. I would keep this. We go through sooooo much soap and hand sanitizer. I would keep it, we use alot of hand soap and im almost out! I will keep this to use during the holiday season. These are really cute! i would keep this. according to the review it seems a good product. I would want to keep this because we love Method products and we also need essentials like these in the house! In fact, I need some handwash in my kitchen right now. Keep, I like Method products and love to put decorative things in my bathrooms for the Holidays, these would be great for Christmas. i would keep this! i love method products and it seems we're always in need of hand soap. I would keep it. We have a lot of guests over the holidays. I love Method products and would probably keep this for my family. I would keep it for us, we love to decorate for the holidays and this would be a finishing touch. I would keep it, I love Method products! I'd keep it. My daughter is potty training right now, so there's a LOT of handwashing going on. This is something that I would keep for myself, but I would give one of them to my daughter to put in her bathroom on Christmas day when she is hosting.